Non-Sport Update Non-Sport Update's Card Talk General Card Discussion Custom Souvenir Cards Infringe Copyright? Custom Souvenir Cards Infringe Copyright? I was on the Bay recently and found 'custom made' cards being sold as 'souvenir' style cards. Complete sets for around $5+. I understand a few people (like myself) on the boards create custom cards for our personal collections. But isn't it infringing copyright by selling these cards? Surprised to see people buying them too. I haven't purchased or viewed any but they sound low grade production, so it's not even value for money on top of using copyrighted images. Is this how low the value of the non-sport trading card hobby has fallen? No, that's not the hobby. No knowledgeable card collector, sport or non-sport, would touch unlicensed cards to any great degree. They know that unlicensed cards will never have any value and actually only taint their collections. At worst they may buy a few as novelty items if they are especially well made and are on a favorite subject. I wouldn't even recommend that, as it contributes to the further violation of copyrights, and unlicensed cards are literally worthless and will never appear in any price guide. Anyway most of these "custom", "hand-made" or "souvenir" cards are cheaply and poorly done, so few are that tempting. People who buy them are often mislead by the descriptions or have little knowledge of what licensed product means. It is copyright infringement if someone is holding the license, but it is also up to the license holders to protect their rights and shut down makers who are producing for profit. Card collectors should just know to stay away from them. There is somewere on the forum a thread on custom cards titled Show us your custom cards. These are very well done and if some companies put out cards the same they wou;ld possibly be a hit. Ok these were not for sale just for the persons own pleasure a lot that are on there are very well produced cards that were sent out to celebrities for signing and some were sent back they looked very go one collector made up mattes i think thats what they were called and those were amazing looking but as you say i do not think that these should be confused with licenced products. But if a person wants to make them and sell them who are we to decry that they do so as long as they do not get passed off as licenced cards. but all said I think that some of the ones that were on the thread were amazing looking custom cards. Yes those customs that are designed for autographs are amazing and the displays are great. Many of those signers don't even have certified cards, so they are quite unique. However they are not cards massed produced for profit as you are aware and certainly you couldn't get the by-mail autographs in any quantity. No license holder would ever go after the maker of such a personal collection. Same way that they don't usually bother a sketch artist for a couple of drawings commissioned on copyrighted characters, well maybe Disney would. But when mass produced unlicensed cards turn up on eBay, then they should and do take notice. I don't think it's our responsibility as card collectors to monitor sellers. It's up to the license holders to take the steps to protect their money and stop the unlicensed makers. But as card collectors it does us no good to buy counterfeit product, which is exactly what these unlicensed cards are. It doesn't matter that they are cheap. They are worth nothing as far as the hobby goes and people are just throwing away whatever little they may spend on them. If, as a collector, you see unlicensed cards or items derivative of cards (like autograph items that are resized copies of a scan of a card) and it looks to be a significant effort, it doesn't hurt to send an email to the license holder. They then have the option to decide if it hurts them enough to pursue. Ebay, for instance, has a VeRO process that they sometimes apply aggressively. Disney has its corral of lawyers protecting their intellectual property but usually the "little guys" don't. In some auctions, the status of an item might be buried in the text description, but it isn't evident from the auction title and image. I've seen unlicensed reproductions that brazenly take images from a manufacturer's website, reproducing even the maker's copyright overlay, so it's hard to say they don't know what they're doing. If you buy one of the knockoff items by mistake, the auction site might reverse the purchase if you dispute it as a misrepresentation. I think sometimes because we are involved with the hobby we tend to think it is greater than it is. In most cases the unlicensed cards are just a very small amount and the people who own the license would not even bother to waste their time in trying to do anything about it. I don't think i would agree that an unlicensed card is no good, in some cases they are much better than some of the rubbish people pay loads of money for in their boxes. This is the same mindset that it is ok to steal from Walmart or Target because they are big corporations and would not notice therefore making it acceptable. For me an unlicensed card is stealing someone else's right that they paid money to use, in this case to make a licensed product, and make a profit depriving the rights holder of money they could have earned. Thieves like to justify their action as noble or flippant, ("It is not like I am hurting any of the small guys- I am striking against big business!"). It is not. It is just a way to justify to themselves that they did no wrong. well going back to what i just sort of said. If the person who has paid for and owns the license can't be bothered to do anything to protect it then the people who make the unlicensed cards will just continue to do so almost as if the owners by doing nothing have given them the go ahead to do so. The problem is so small that it does not impact on the hobby in any way that is worth bothering about, i'm sure that if it did then the big players would take action. Yes, this is infringement. . . These types of cards have been around for a long time. Rather than seeing these as a sign of how far the hobby has fallen perhaps it's a sign that the hobby is coming back -- people wouldn't be making these if there wasn't some sort of demand. . . I'm sure everyone's come across the guy in Germany who sells "high quality" photos of autograph cards. Same, same. Yes, i'm sure we can all agree that licensed product is superior to homemade junk and only licensed stuff will have/hold value. Wasn't there an issue with an unlicensed Buffy set from Australia? Cute examples. However the poor quality of those licensed sketch cards in no way changes the rock-solid rule that the hobby does not recognize unlicensed cards. I'm sure you know that. Sketch cards bring in the whole subject of art and licensing issues get murkier. Even with that, sketches on licensed cards, put out in licensed products, will command premiums. Not those sketches, nothing will help them. Most of the market data shows that quality determines price, if only in the sketch card market. Poor quality licensed sketch cards do not command a premium simply because they are licensed. You might argue that the people who bought them are stupid, but the fact remains that high quality unlicensed stuff still routinely sells for more. 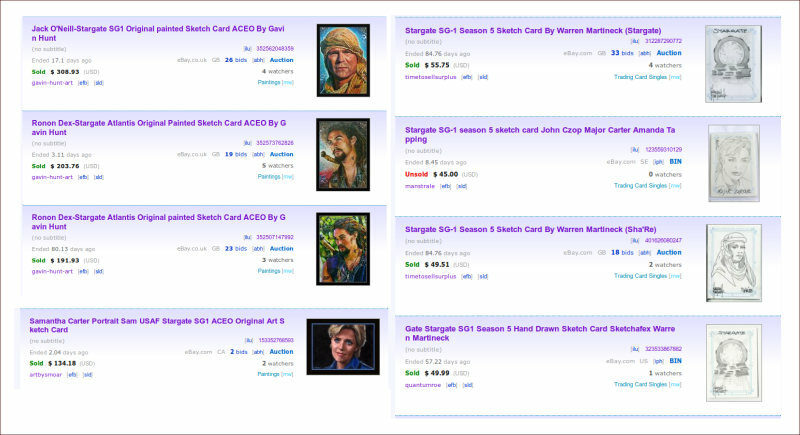 So I'm sorry, but you are jumping into a discussion that compares ACEOs to licensed sketch cards now. Very different and more complicated topic than just talking about counterfeit unlicensed cards. While ACEOs are unlicensed, and often depict licensed characters, the way card collectors view them as artwork is much more nuanced and certainly depends on the skill of the artist. While most decent ACEOs are typically in the $20 - $30 range, you have chosen to pull out really beautiful ACEOs and compare them to minimally attractive licensed sketches. No surprise that they sold for way more and I'm sure the buyers are quite happy with them. That is completely off the subject we started with, but you are making a point that is valid about art and how we as card collectors look at sketch cards. Have I ever bought an ACEO? You bet I have, also got commission pieces from artists. Does that mean I'm endorsing unlicensed cards? Well no, absolutely not. Apples and oranges. Actually I was just responding to the above quote, quality will command a premium regardless of the licensing state. By commissioning an artist directly to produce a card of a copyrighted character that the artist neither owns or has a license to, rather than buy a box with a random sketchcard in it, which might or might not be good, you're still denying that company income for which the company has paid a fee. Pretty much the whole purpose of copyright. Last i checked sketchcards were still considered premium hits. If licensed stuff is so great why would there even be a market for ACEOs and commissions? Perhaps someone doesn't want to risk getting a Ryan Waterhouse monkey sketch and would rather fork over money they would spend on a box (or 2 o3) to Sean Pence to get something that looks remotely like art?. So yes, ACEOs and commissions are as unlicensed as a crappy bootleg from Hong Kong. But, its the fault of the licensors, approving tons of shoddy stuff for the sake of a few bucks... and also not paying artists anything. The card companies have created much of this monster themselves, with the concept of "artist proofs" for ORIGINAL ART when proofs are for printed pieces only. But bad business practices are another convo entirely. 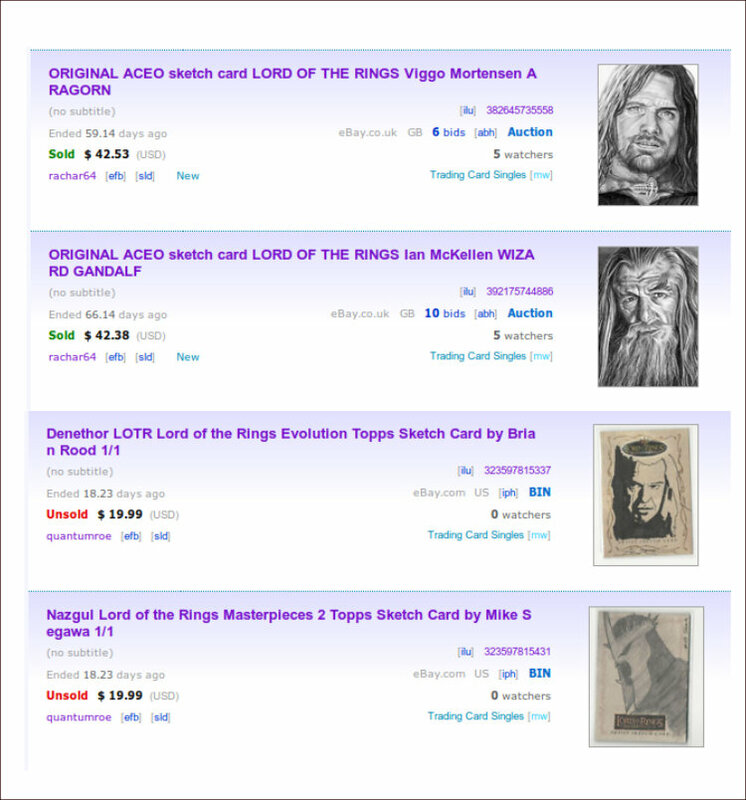 ACEOs or other original art isn't comparable to unlicensed trading cards. Unlicensed things can have value. Both statements can be (and are) true at the same time. But ACEOs, Art Card Originals and Editions, can also show subjects that don't need a license or no one knows who has the license or the license holder doesn't care about a 1/1 sketch. This is original artwork, not mass produced unlicensed sets, and its all over eBay. Commissions are done for private collections, some artists won't do subjects that other artists will. You are bringing up valid points about the gray areas in sketch cards, but it isn't a defense of unlicensed cards. It's just that lines get blurred with hand drawn art and the artists themselves are generally well aware of what they can get away with. I do want to clarify my post, which you say prompted your response, "sketches on licensed cards, put out in licensed products, will command premiums". I assumed it was understood that I meant those that were of good quality would command a premium for being an official sketch from an official product. Junk is junk and gets no premium for anything. That is what I said in the next line about the 3 terrible sketches you showed. By the way, I own 2 of their lookalikes myself. I bought quite a lot of those Indy boxes. Anyway sketch cards are always an interesting and complex subject and opinions depend on who you are, collector, artist, manufacturer, buyer, seller . . . I do know what you are driving at when you say that "card companies have created much of this monster themselves". Another subject for another day perhaps. Why are you endorsing apples and oranges? Quick Reply to: Custom Souvenir Cards Infringe Copyright?